The Gulf Stream is a river that runs through the ocean. This strong current begins with waters that flow from the coast of Africa to northern South America. There the African current splits in two. One river flows northward along the outside of the Caribbean islands. This is called the Antilles Current. The other river enters the Gulf of Mexico then exits at the Straits of Florida. This is the Gulf Stream. 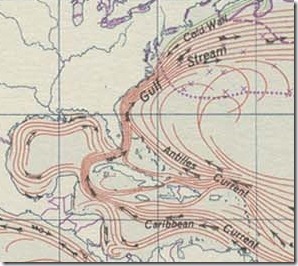 North of the islands, the Gulf Stream absorbs the Antilles Current and flows northward along the eastern coast of North America. The Gulf Stream water is warmer, saltier, and much faster than the water through which it flows. Its speed is fastest at the surface, where it reaches a peak velocity of about five knots. Sailors must account for this speed when sailing either with or against the current. When the wind blows from the north, a “norther,” huge waves can build up as the wind and the current collide with each other.